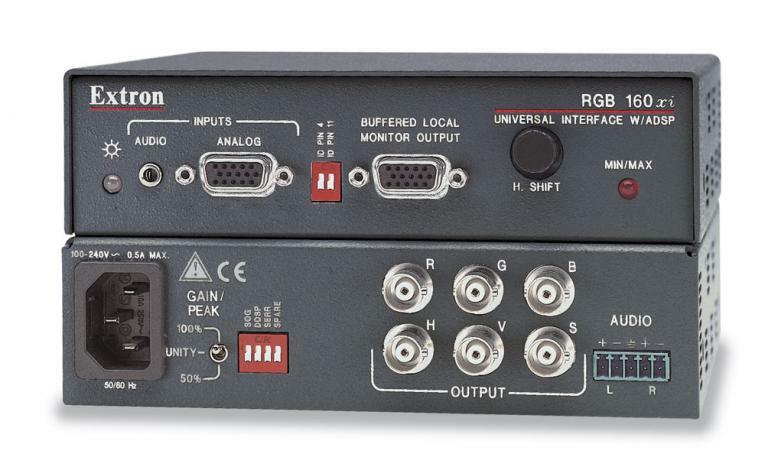 The Extron RGB 160xi is a universal, analog computer-video and audio interface with ADSP?. It allows computer-video resolutions up to QXGA to be converted for output to projectors and flat panel displays. It also accepts unbalanced computer stereo audio and converts it to balanced, line level stereo audio. Extron Advanced Digital Sync Processing or ADSP technology provides all-digital processing of sync signals, eliminating compatibility issues encountered when using analog sync processing with digital display devices. 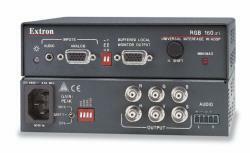 The RGB 160xi is ideal for use in applications that require signal amplification and sync processing to ensure compatibility between many different types of displays and computer-video signal sources found in classrooms, auditoriums, and conference rooms. ADSP? - Advanced Digital Sync Processing ? An exclusive Extron technology that conditions sync signals to provide reliable operation with a variety of signal sources and display types. ADSP reshapes the sync signals, restores proper TTL voltage levels, and maintains the original video to sync timing relationships while allowing centering control. DDSP? - Digital Display Sync Processing ? Allows the sync signal to pass through without altering sync pulse or width. Disables other sync processing features such as horizontal and vertical centering. Three-position level/peaking control ? Boosts and equalizes video signals to compensate for signal loss and high frequency attenuation that occur in long cable runs. Horizontal shift control ? Shifts the displayed image left or right on the display screen. Also called "horizontal centering". Active PC audio to balanced audio interfacing ? Converts computer-generated, unbalanced audio to balanced line level stereo audio for output on a captive screw connector.